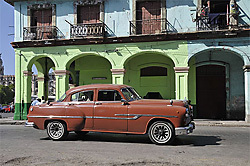 Cuba, the largest Caribbean island. Its thousands of kilometers of beaches are the color of the pearl, its music captivates you. Spain and Africa have succeeded here a fabulous blend. Add to that a half-Spanish mid-colonial architecture. But Cuba is also a great misery. Hay que luchar! ("There has to fight!"). This exclamation is found throughout the Cuban philosophy. This lucha is the only means of survival. The people are poor, helpless. It should however be noted that many services to the population are cheap (transportation, entertainment, electricity, rent, etc..) Or completely free (medicine, education). This country is a "socialist Eldorado" some will say. Paradise for tourists, certainly, but not for the people! Regime, a kind of "dictatorship" velvet, prevents Cubans from being truly free, and youth, who has not experienced the revolution aspires to new horizons. Hay that Inventar ("There has to invent"), say the Cubans since the beginning of the "special period" in 1990, crushed under the weight of everyday problems. The population is aware that the economic misery is the product of an outdated system and a U.S. embargo moot. Cubans expect little of the official economy, paralyzed by bureaucracy. The economy is the only way to bring them additional income and especially the convertible pesos which they so desperately need. For it is in convertible pesos (CUC) that are sold most consumer goods. Interesting information. I feel pity for the people.